10 years ago, Mike Ashley was a popular owner of Newcastle United. Having bought the club in 2007, he sacked the under-performing Sam Allardyce, replacing him with a club legend in Kevin Keegan. Ashley was one of the lads, even sitting with Newcastle supporters for the derby game at Sunderland. It seemed he understood the club, and the fans were right behind him. But then Keegan stepped down as manager – he later won a case for constructive dismissal – finding he could not work for Ashley. Keegan was not given control over transfers. After reluctantly agreeing to sell James Milner – falsely promised by Ashley that Bastian Schweinsteiger would be signed as a replacement – and after seeing players brought in that he didn’t want or rate, Keegan walked away from the club he loved. Newcastle fans were outraged, and angrily protested against Ashley. Things were never the same again. Ashley remains at the helm, but is a dispassionate, aloof owner despised by most Newcastle United fans. As the fall out continues over Bradford City’s complete and utter collapse since January, and fans debate over whether chairman Edin Rahic might be the next Coventry, Charlton or Leyton Orient owner, to me it is the comparison with the early reign of Mike Ashley that seems most apt. Whilst Bradford City lost 5-0 at Blackpool on Saturday – a new nadir to an utterly appalling second half to the season – Rahic and his family were back in Germany. The joint-owner missed the disgraceful performance from the players, and the angry reaction of a sold out away following who even resorted to singing Stuart McCall’s name. Rahic has missed more than half of City’s games since taking the controversial decision to sack McCall in early February, after six straight defeats. This was someone who loved the club, never missing a home game and even going to the development squad games. Rahic is said to remain hands on away from matches. A break with the family is probably needed by Rahic, and certainly not something to begrudge. But when his batteries are rercharged, there remains a mounting list of problems back at Valley Parade. And the increasing distance between chairman and supporters is amongst the issues. Ashley would eventually acknowledge he made mistakes in first sacking Allardyce and then not properly backing Keegan. But the damage it caused to his standing amongst supporters is something he could not or would not repair. And Newcastle United remains a much poorer club for this fractious relationship. We don’t want the same at Bradford City. Let’s be clear, it is not Edin Rahic’s fault that City were so badly beaten at Bloomfield Road. The players continue to down tools. Rumours of a split in the camp are supported by what we see with our own eyes. The Tony McMahon absence in January was allegedly due to something more serious than an interest from Scunthorpe United in the player. And it has had lasting repercussions. The players have failed to perform for the club ever since the events in and around the Yeovil Town game, where Luke Hendrie made a dramatic departure from the team hotel. Those close to the players tell of a dislike within the camp towards the chairman, with the rumours about clashes over bonuses failing to be adequately cleared up at the fans forum. The players stopped playing under McCall, and they aren’t playing for Simon Grayson either. It is therefore obvious the players have stopped playing for the club. To us supporters, paying good money and investing time to watch the games, this is unacceptable – and certain players need to be pushed out during the summer. 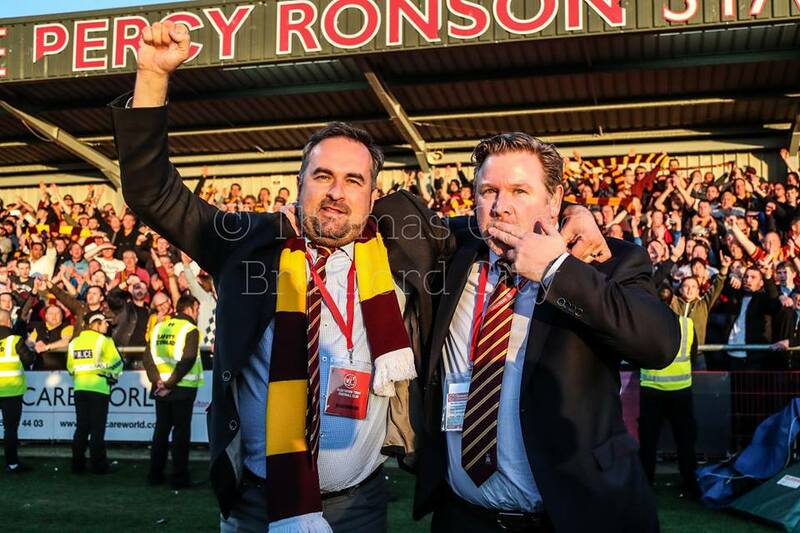 It is absolutely galling, especially when our recent history has been lit up by players achieving astonishing things by ploughing their heart and soul into Bradford City, and the meaningful bond that developed between the team and supporters. That connection disappeared when the last of the history makers exited last summer. How we have missed Stephen Darby, James Meredith and Rory McArdle; even others who learned to embody these values, such as Josh Cullen, Mark Marshall and Billy Clarke. It’s difficult to look at any of the current squad and feel that same affection. Even the likes of Romain Vincelot and Tony McMahon are undoing their legacies. The players clearly have their reasons for feeling the way they do, and those in a position to question them need to get to the bottom of it and fix it. But this shocking attitude is badly hurting fans. If the players don’t want to play for the owner, fine, but what about us? What have we done to deserve such spineless performances? They must improve, or the atmosphere during the five final home games will grow incredibly toxic. This is the game group of players who were in the play offs for more than half a season. They are capable of much better. So show it. What to make of Simon Grayson? He was the best candidate for the job, without question. And of any available manager out there right now, Grayson’s record remains superior. It’s not his team, and the players he has inherited are not suited to his style of football. It’s difficult to be judgmental, yet still there is a sense of disappointment that Grayson has failed to impress. He almost boasted about his credentials when he first joined, but has struggled to back that up. If he stays, he will go into next season without a honeymoon period from City fans. Ultimately, the size of the budget will determine his future. Which brings us back to Rahic, and his ambitions and capability to arrest Bradford City’s slump. There have been rumours of interest in buying the club from Rahic and Stefan Rupp, but Width of a Post understands there is absolutely no desire to sell up. For Rahic – who invested a six figure sum into the club, alongside Rupp’s larger capital – running a football club remains his dream. Personally, I don’t buy into the argument that Edin is a bad person, out to ruin the club. Whilst there are, admittedly, troubling comparisons with the early reign of Charlton owner Roland Duchâtelet and Ashley’s, I believe Rahic’s intentions are good, and his vision for bringing success to the club is a laudable one. The problem, however, is the way he is going about it, and the mistakes he is making – which have very much fallen into the public domain. And it is damaging his credibility and his reputation. Whatever your view on sacking Stuart McCall, it hasn’t resulted in any improvement in the club’s fortunes – the opposite, in fact. All it has succeeded in doing is upsetting a huge proportion of fans, and creating a mood of disillusionment that is proving impossible to shift. The transfer strategy Rahic has instilled and oversees, as Head of Football, isn’t working, even if many of the principles behind it are credible. With a host of non-playing staff having also departed behind the scenes this season, Bradford City have started to resemble something akin to the Trump administration. Some of those who have exited talk of an atmosphere of feeling belittled and not trusted to do what they’re good at. Most have not been replaced. The toxic atmosphere has seemingly spread into every area of the club. The Matter of Heart film featured a number of staff admitting they found Edin Rahic difficult to work with. That his hands-on, constant-barrage-of-questions was exhausting. No one likes to be micromanaged. Edin has invested his money into the club and cares deeply about how it operates. But good leadership is learning the value of delegation and empowering people to build and develop their own skill set, even if they don’t always come to decisions that you necessarily agree with. A good delegator ensures their team or organisation functions better and achieves more. A poor delegator overburdens themselves with too much work, whilst employees become under-used, bored and feel like they’re not trusted. The loud blasts of criticism Rahic is now receiving are unrelenting, and they are only going to carry on from some fans. Unless City miraculously turn around the season, it will continue into the summer and then only get worse if next season starts off slowly (imagine, also, the backlash if Grayson elects not to stay). We are a long way yet from supporters throwing pigs onto the pitch or halting games through sit down protests, but it feels like we are tentatively tredding down the path that leads to such darkness. And that should worry everyone who cares about the club. So what is the solution? Because Edin isn’t going anywhere, and nor do I personally want him to. I’ve met him twice, and he is a good man who genuinely loves the club. He lives and breathes what he does. He’s moved his family from Germany to West Yorkshire to be here. His commitment, dedication and enthusiasm are qualities that can add huge value to the club. But at the same time, he doesn’t look like he knows how to fix this mess, and that he is out of his depth. That sounds like a criticism, but it’s not meant to be a malicious one. We are talking about someone who has only limited experience of running a football club. Yes, he has done scouting in Germany and was on the board at Stuttgart Kickers. But that doesn’t give him the necessary experience and perspective that is needed during downturn moments like this. Rahic might have ideals about how to make a football club successful, but this is the first time he’s tried to put it into practice. And to add to the challenge, he is implementing it in a country he is less familiar with, and at a football club much bigger than Stuttgart Kickers; bringing with it a different level of pressure. In such circumstances, mistakes are inevitable. Rahic is on the biggest learning curve of his life. Did he realise, for example, just how much he would need to know about the cost of drainage underneath a football pitch? I bet he knows more about it now than he ever wanted to. Rahic needs to understand that he needs help to get through this crisis, and he needs it now. It’s no use isolating yourself, or hiding away in a sulk over the fact not everyone shares your view on events. That’s why I believe the best solution right now for Rahic is to take a step back. Accept the help of others. Allow them to take on more responsibility. Put people in charge who know what they’re doing. James Mason can be that man. He’s been part of the Valley Parade scene since 2014, when he was brought in by Julian Rhodes and Mark Lawn to follow in the formidable footsteps of David Baldwin. He has been able to add to the success of the club in recent seasons, most notably significantly building on the season ticket initiative that has seen sales reach record figures. Mason has the experience of difficult moments – ask him about the Reading cup ticket fall out – and has been here to turn around the club through poor runs of form. He has had some involvement in signing players, and knows the club inside out. He understands what it takes for Bradford City to succeed. And, like Edin, he also cares deeply about the club. When David Baldwin joined Bradford City in 2007, it was on a six-week arrangement to look at how the club could generate more commercial income. He was asked to stay on and given more responsibility, moving onto look at the club’s infrastructure and if it could become more efficient. This was followed by negotiating the buying of the office blocks the club was renting at a high cost from Prupim, and setting up the shirt sponsorship deal with Nike. And then Baldwin moved onto the footballing side of things; tackling the difficult problem of inadequate training facilities and supporting Phil Parkinson with signing and releasing players. At the same time as Baldwin’s responsibilities and influence grew, Mark Lawn began to take more of a step back. Like Rahic, Lawn had attempted to be hands-on during his early years at the helm – at one stage he was even cooking the players’ lunches – but in time he learned the value of letting talented people like Baldwin assume more control, and to ease his own workload to focus on specific areas. It is no coincidence that Bradford City began to become a more successful football club over this period. Following a similar path now looks like a workable solution for Rahic and Bradford City. James Mason is a popular chief operating officer – you only had to see the professional way he communicates on Twitter to see the rapport and understanding he has with the fans. His article in the Telegraph & Argus made great reading, and he even fronted up on local radio after the Blackpool debacle. He is also well thought of outside of the club. Indeed WOAP understands he turned down an opportunity to work elsewhere last summer. Blackburn – far from the example of a well-run club – offer an interesting comparison. The Venky family bought the club in 2010 and instilled their own ideas, without taking advice from people who were running the club, and it all went wrong. The Venkys have not attended a game for four years and, this season, have stepped back from running the club, leaving it back in the hands of senior staff. Blackburn are on course for promotion. For Blackburn to have disinterested owners is not a good thing, but at least they are letting the right people run it day-to-day. In a more prominent position, Mason can start to win back supporters feeling disillusioned by the club. His media background makes him an excellent public figure for the club. Mason has already had some involvement with signing players. He can talk around unhappy sponsors (I’m sure we’ve all heard the rumours). Retain and set up commercial agreements with suppliers. There is not a part of the business he doesn’t know. By giving Mason more control, and trusting him to make the right decisions, Rahic can ease the pressure on himself. There is a coldness about the relationships these supporters have with their clubs, and it would be a very sad day if Bradford City went the same way. We have almost always had an open relationship with our chairmen. It hasn’t meant previous owners have always been popular, but it has almost always felt like they are one of us – caring as much when we win, dreaming the same dreams. Rahic very much began out that way, and I hope we can get it back in time. We don’t want a wall up between the boardroom and the stands. We don’t want it to become “them” and “us”. It won’t be easy to fix this, and it won’t happen overnight. But that is what Rahic needs to focus on. Start attending community events, engage with supporter organisations, recommence speaking again to Simon Parker and the Telegraph & Argus. Bit by bit, step by step, restore your reputation with the fans. And – after so much talk from him about City getting to the Premier League – start fine-tuning that long-term strategy and bringing it to life, whilst Mason concentrates on the day-to-day decisions. Of course, that is not the dream that Rahic himself talks about in Matter of Heart, and his reasons for buying the club were to stamp his personality on the club. But that dream has turned into a nightmare. And it needs to be fixed as soon as possible. The talent and expertise lies within the building to turn this around – Rahic just needs to empower people to do their jobs. Wow what a fantastic piece of journalism!! To me this piece embodies the sentiment felt by every true Bradford City supporter. We all feel that totally dejected at the moment that someone from within the team should explain to us, the paying public, why they are behaving in this way. I for one don’t believe that we can’t at least put on a decent performance on the pitch regardless of what is going on behind the scenes. An excellent and well observed piece, Jason. Herr Rahic would do well to take on board your suggestions. It is very disappointing that Edin seems to have ‘gone dark’ just when supporters are craving information and explanations about the current state of affairs. Although I have already renewed my season ticket, I can understand how many supporters are hesitating and want to know if there is a strategy and competitive playing budget for next season. Of course not renewing, is a sure way of reducing the playing budget and so the downward spiral begins (continues). Communication is a vital part of any commercial business and now is not the time for Rahic to keep his own council. Couldn’t agree more. Very well said, Jason. I don’t think there is a word in this article with which I can disagree. The problem is whether the two people who need to read and understand it will do so. If they do, good. If they don’t, bad. One thing that strikes me is that Mr Rahic, in my opinion, made a mistake in appointing Grayson for such a short time. Since it is obvious, and was obvious even at the end of Stuart McCall’s reign, that certain players were not trying, those same players probably think that they can get away with it under a short-term manager who will not be there next season. Possibly, with hindsight, they should have given the job for 4 months to Greg Abbott. But, there again, hindsight tells us that McCall should still be here. I bought a season ticket 2 weeks ago, and rather wish I hadn’t. Correct me if I’m wrong but wasn’t it rest of season at Mr Grayson’s request ? McMahon should have been allowed to go to Scunthorpe and should have been fined for refusing to play whatever has happened. The one person who can force Edin to change is Stefan who has invested £4m in the club compared to £1m Edin has. Maybe it is Stefan who has insisted that Edin hasn’t interfered with Grayson as much as he did with McCall. The last FIVE home matches are not going to be a lot of fun. Excellent article Jason. This whole situation Is upsetting me and my family who are all season ticket holders and yes we have all renewed. As you say no easy answers or solutions, but it is time that Edin and Stefan have a heart to heart on the best way forward. It is quite obvious now there will be less season ticket holders at VP next year, which will reduce the budget. However unless we want to tumble into the basement, extra funds will need to be found. When you plan to run the business in a sustainable fashion that is commendable, but you must also have a back up plan. Massive mistakes have been made, and this has had an impact on the whole club, but they as custodians on this proud club must not allow any further disintegration. It is so dissapointing that we have come to this state of affairs. Jason. You’ve written some good stuff in the past but this tops it. It’s all very depressing at the moment. Perhaps you could email it to Herr Rupp. I would also like to pick up on one point. If I turn up for work and don’t try because I don’t like my boss then I get sacked. Why should football be any different? It shouldn’t. But just think for a minute about how toxic the atmosphere in the dressing room and on the training ground must be right now. Personally I don’t believe it’s a “Won’t play” scenario, but a “Can’t play” one brought on by what has gone before. As you say, you would get the sack for refusing to work, but in a confidence business where there is less than none, it’s hard to imagine any one player being able to dig themself out of the mire. It has to be the squad as a whole who need the full backing of the owners, manager and staff. They HAD the fans, but they will take some convincing now! Great read you have said everything that I and a lot of others feel, and I say unless we hear from the horses mouth ie owners about plans and solutions for the future there’s no way I’m wasting good money on bcfc I’d rather go to ikea ?? and that’s saying something. Another piece, Another piece filled with anti rahic comments. I like edin but, i dont think its edins fault but, etc etc. Sorry jason, you keep saying there is a discord between fans and owners but do pieces like this really help? Is it not stirring the pot even further? Hell we are even at the point, of pre empting the backlash edin will get if next season starts badly. You have touched, rightly, on the biggest problem, the players. They need to be ashamed of themselves, not edin rahic. These players ultimately cost stuart his job, not edin rahic. The poorly recruitmented squad, the less talented squad, the cheap squad that had us third in the league close to Christmas, have decided to down tools. Downing tools in such a way, that stuart was sacked, a proven manager like Simon grayson is having to publicly ridicule them, and same group have turned fans against the club. How about a nice piece shaming them? Mark, I think we have to accept that those journalists who are close to the club know far more about the facts than they write about. Quite simply, many of them depend upon the support of the club to enable them to do their job and, therefore, can’t wash their dirty washing in public. I’ve been to the training ground and heard and seen things I wouldn’t even dream of repeating on social media. It enabled me to draw my own conclusions. I no longer go to Apperley Bridge and I’m not renewing my season ticket. The above is an excellent article from Jason and he’s highlighted some very very important points. Slowly, but surely, from a variety of sources, the full story will emerge. Thanks for your comments. I fully appreciate you have a different point of view to me. It’s a game of opinions and would be dull if we all agreed. Let me start my reply with a really important caveat. I am just a fan like you. My opinion is no more or less valid than yours, and I would never pretend otherwise. Now let’s look at the backdrop. Since Jan 3 City have picked up just five points from 11 league matches. They have gone from play off contenders to mid-table. There was a really underwhelming January window where the club didn’t strengthen to the level they themselves promised. There was a sacking of Stuart McCall, that a lot of people disagreed with. The new manager has made no difference. Performances have got worse. On Saturday City lost 5-0 to Blackpool, and fans chanted “you’re not fit to wear the shirt” and Stuart’s name. I was not at Bloomfield Road, so none of that has anything to do with me. I don’t know what your views are on the fans reacting like that at Bloomfield Road. And the massive social media backlash that has seen Edin Rahic and the players come in for bucket loads of abuse. Maybe you don’t agree with fans for being negative. Or maybe you accept everyone has a right to air their frustrations. If it the latter, surely I am also entitled to express how I feel? It doesn’t mean I’m right, and my opinion is no more important than anyone else’s, but I’m a City fan. Every City supporting friend, and every fan I speak to, is really angry right now, and most of them are blaming Edin for it. Again you don’t agree with that conclusion, and fair enough. But please don’t single me out for criticising the chairman when so many other fans are doing the same. This anti Rahic mood has not come from me – I’ve hardly written about the situation since Stuart was sacked – it has come from many people viewing a sacking as harsh, feeling let down by the window promises not being fulfilled and upset that the chairman has gone hiding. I’ve been producing this site for six and a half years now. Six years of which were near constant progress and lots of positive coverage came from us. Yet I was repeatedly criticised for being pro-club and “towing the party line”. Now we have had a period of form worse than at any point in WOAP’s existence, and it is hard to find the positives in it. I’ve now been told by a few people not to write any articles. Not to be negative. But if this site is just here to only write about positives, that would mean we really are just a PR tool for the club. I have tried as hard to be a positive as possible, because I don’t want to write negative article after negative article. As an example, when we beat Gillingham I decided to write a match report. I didn’t want to accused of ignoring the good moments, and wanted to take the opportunity to praise the club for a decent victory. As for this piece, whilst there are criticisms within it of Rahic, I personally think I’ve said a lot of nice things about him to. I assume you have read the article in full, so I’m disappointed you have overlooked that. Try going on social media and message boards, you will much, much worse things said about him than what I have written. I have not called for him to leave. And I’ll be honest, a few people have had a go at me today for not writing “Rahic out”. But I understand that not all fans blame him, and I’ve tried to be sensitive to that. I have quite a lot of sources and an insight into what is going on at the club, and all indications point to the problems beginning from the top. I know you don’t want to hear that, but I hope you can respect that a lot of fans want answers right now and are very worried about the future. And equally, the piece is scathing of the players. It blames them for the loss at Blackpool and the terrible form. For what it’s worth, I don’t really like writing articles shaming players. I remember Peter Jackson’s short reign where he just slagged off the players and it sat uncomfortably with me then. However, if they keep losing and putting in terrible performances, I promise you I will write further pieces having a go at them. We are all in the same boat, we are fans that are extremely concerned about the rot that has set in. Our feelings arent actually that far apart on the whole, i just think this weekend was a step too far from the players, and its them, not Rahic that should be copping the pelters. Regardless of what has gone on, that was unacceptable. Edin Rahic can be blamed for a lot, but not saturday. You say it doesn’t sit easily with you lambasting players, but why should it be open season on the owner? You say, any more performances like that and you may start to call the players out jason, but in your own words, they have taken 5 points from 11 games since January. Those players have not turned up and put in disgusting performances at doncaster, Blackburn and Blackpool, us, as fans deserve better. You say you have sources at the club, have they told you anything about the supposed clique amongst players, the drinks gang, that have been rumoured in recent weeks, if true, do they deserve to be free from blame. and hide behind the rahic criticism. Is it acceptable to just down tools regardless? These players ultimately in doing this cost Stuart McCall his job, a club legend, pally with the players, but still unable to get a response from them. “you’re not fit to wear the shirt”. Cheers. I accept your point, but like I say I speak to sources about what is going wrong and they all point to the owners. I am not making anything up or shaping a narrative to suit any agenda. “Let’s be clear, it is not Edin Rahic’s fault that City were so badly beaten at Bloomfield Road. The players continue to down tools. Rumours of a split in the camp are supported by what we see with our own eyes. The Tony McMahon absence in January was allegedly due to something more serious than an interest from Scunthorpe United in the player. And it has had lasting repercussions. Jason, you’re bang on with your article, the equilibrium was upset by the board. The rest falls in by the domino effect. Very hard to reset, they deserve all the criticism they receive. Quality and heartfelt reply into worrying times for the club. Cracking article on the clubs current plight. I personally feel that this weekend the focus should be on the players, not Edin Rahic. They should be getting absolutely pilloried for that spineless performance, yet I feel they are getting off relatively lightly because the focus instead is on Rahic. Maybe on some level the players think they can get away with it because they know the fans seem to blame Rahic more than the players, and maybe the players don’t think Grayson is going to be here next season so for those contracted for 2018-19, there won’t be any consequences. Not that I think Rahic is blameless, not in the slightest. The direction of the club comes from the top and it’s all fallen apart, and he is ultimately responsible. But we’re not going to see if he has learned any lessons until the summer. With the transfer window shut there’s very little he or Grayson can do to change anything until then, so maybe it’s best to leave off until then. By all means, if he makes the same mistakes, then slaughter him in the summer and next season. But the fans have put their message across. Now let’s give him chance to see if he has learned. As for Grayson, if he wants to stay, he needs to sign a contract now. It will be a sign of intent, it will leave most of us feeling a little more confident about next season, and it will let the players know there really is nowhere to hide because he will get rid of them, as he said yesterday. Finally, all these rumours that are floating around – someone needs to start doing some proper journalism and investigating them, either to put the rumours to bed or to reveal evidence to substantiate them, because the way unsubstantiated rumours have taken hold has added to the fractious nature of the last few months. If I understand correctly at the fans forum, Edin denied there was any problem with bonuses and said to ask Wyke or his agent if we didn’t believe him. So why doesn’t a journalist – perhaps someone from WOAP – ask Wyke and his agent? Or ask the PFA? Why doesn’t someone ask McMahon what happened in January? As far as I can tell, nobody has actually asked anyone anything in order to get some facts. We can only dream of Edin giving a more hands on role to James Mason, but i can’t see it happening. It was his dream to run a football club and we have seen first hand how much of a control freak he is. He is involved in every single department of the running of the football club. Even having his say in who should be in the team. His statement “I know about football. You have to take me seriously” is now ridiculed on social media. I think James would be great at running the club, he has all the attributes to do the job, but i just don’t think Edin would take a backwards step. Just to add to not engaging with fans. Historically Mike Harrison has always provided the owners, manager, and captain’s over the years with a copy of every issue of City Gent. We hear that both Edin and Stefan refuse to read it. It’s likely they do not read WOAP or even maybe the T&A and the fans comments. So in addition to not recognising the Supporters Groups including the Trust, they are denying themselves a ‘feel’ for how the fans are feeling. Whilst I am sure they are aware of the current mood of the fans, this represents a major disconnect with the supporters. I find this very disappointing. Even ML who was not the best person in the world where supporter groups were concerned did recognise the importance of them and did meet with them. GR used the supporters groups and fans forums in a very clever way, and his door was always open to any supporters. He was a past master at this. Wonderful article…let’s get this season over with and pray it can be resolved in May, June and July. Otherwise we are heading back to League 2. A very fine piece of work Jason. I accept you have had some access to Edin but I would bet my life he doesn’t ‘love’ City. Himself very much, no doubt, but City, no. Excellent article Jason. Seeing such a well-balanced perspective puts it all into sharp focus and leads me to two principal thoughts: 1. hindsight (being that wonderful thing): it was so wrong to lose Stuart 2. foresight: Simon Grayson won’t stay around after the season (willingly or unwillingly). To coin the Latin phrase that leaves us in self-doubt and apprehension: Quo vadis (where are you going)? There’s a very interesting divide between those (95% of fans) who know exactly what’s gone on- City has been like this for 40 odd years and a secret has never been kept- and those who don’t hear facts and are choosing therefore simply to lay the blame at the door of the players. They cannot see that the Charmen have done wrong. If only they knew now what will emerge in time. James Mason made a (decent) statement on Friday saying that football is a game of adversity. On first read it was a prophetic and clever statement. And probably true. But, stepping back from it, you realise this is a heavily self induced adversity that arises from a period of bliss. Adversity could not even be seen on the horizon as the season closed in 2016. Even then, a loss in the play off semis was shrugged off. Players still cared. We loved the team and they loved us. We were one. Yet despite this, in less than 2 seasons, we have gone from sky high to lower that whale poo. And we had a trip to Wembley bang in the middle. This is some evil genius stuff. I doubt any two others could have made a worst fist of it had they tried. The Edin sympathisers rightly say “no one goes into a business to fail”. True. Equally true is the fact that thousands of businesses fail on a yearly basis and individuals go bankrupt. No one sets out for this to be the case. They just don’t have the requisite skill set to fulfil their dream. And this is why Rahic and Rupp must read this and act. NOW. Because he simply doesn’t have the tools as yet to achieve his dream. He must swallow his pride and develop his own knowledge from afar. And then gradually reintegrate himself back into the fold. And Mr Rupp. Memo to the boss. You’ve bought a football club that is the only shining light of a city. Get involved please. Take an interest and act. Don’t let your mate wither on the vine. That’s not fair. Otherwise you’ll be one of the thousands that fails. And I don’t want you both to fail. Honestly. I appreciate that it’s all about opinions and you can only speak as you find. But I will raise an eyebrow when someone says they can form an objective judgement of someone’s character after meeting them twice. Especially when that person will be aware that the individual in front of him is the author of a widely read blog about the club. I’d rather judge him by how he’s treating the employees (including the players) that interact with him on a day to day basis. I have to say from everything I’ve heard recently, after the way the previous manager was treated and whatever went on at Yeovil. He’s far from the kind of person that will get those employees running through brick walls for him. I’d also doubt that he ‘genuinely loves the club’. He’s bought the club as a business, hoping to one day sell it and create a profit. I equate love with irrationality, unconditionality and doing anything you can for that entity regardless of the cost.Does he genuinely want to see the club succeed? Certainly. But the City supporters that will be at Rochdale after witnessing the debacle at Bloomfield Rd yesterday. They’re the people that genuinely love Bradford City. He’s hardly been seen at both home or away games since Grayson arrived. Whilst everyone needs a break at times, his is hardly the behaviour of someone that will be present through thick or thin. Turning up for the playoff semi at Fleetwood and triumphantly saluting the fans on the pitch is the easy part. If he doesn’t want to be around when the extrement hits the fan, the supporters have hardly heard from him in person since the fans forum. Then I’d say the comparisons with clubs in heaps of trouble are more than fair. Something is undoubtedly amiss behind the scenes, but it’s been left to fester rather than being lanced. Which I don’t think is healthy for all concerned; players, staff or supporters. I was more than willing to give him a chance when he arrived, as I think most City fans were. I didn’t and don’t expect vast sums of cash to be expended. A similar philosophy to what was in place was fine by me. In my opinion they’ve now thoroughly broken what didn’t need to be tampered with. Whether through inexperience or hubris I’m now unsure. His silence has also done nothing to quell my unease or make me think any more of him. He didn’t need to make grand statements either, just some reassurances that he was trying to put it right. Everything I’ve witnessed since Xmas has left me feeling very uneasy about the club’s future and overall trajectory. I thought City was a club that was on a slow but steady rise. I’m now wondering if they’re now going to become the next Leyton Orient, the similarities are both obvious and terrifying. I do honestly think that Edin has major issues surrounding his own abruptly shortened football career (however hyped up it may have been) to the degree of obsession and this is what is driving his decision making and behaviour. The major problem is the fact that everyone can see that Stuart was set up to fail this year and the promises made in November about backing Stuart in January if we were within touching distance of 2nd was patently untrue. The allegedly serious bid for Keifer Moore in early January increased the anticipation which petered out significantly as the window closure beckoned and apart from McCall’s recommendation of McGowen the remainder were panic loans. And resulted in fans thinking they were being treated like fawning idiots with no knowledge of football or public relation hypes. It’s obviously not in Rahic’s interest to run the club into the ground. But I’m sure that McCall’s success caught him on the hop and he was never fully behind him. Significantly there was no joint celebration with Rupp/Rahic and McCall on the pitch at Fleetwood in the playoff semi 2nd leg. I sure that Rupp will be have had words with Rahic regarding the negativie impact is of his micromanagement and this coupled with Grayson’s pre warned demeanour at the start of negotiations would have strengthened this stance. Last season I defended the owners from people who were saying they were getting all the money from the club. Whilst I believe that is still untrue its the comments from both Rahic and Rupp that cause me concern. I’ll give you 2 then you can find the rest. They are not hard to find. One that has been mentioned on here about backing Stuart if we were fighting for automatic promotion LIE. “I read Stefan’s piece the other week, and a lot of it was understandable, but a couple of things he said really disappointed me. “One thing is he said he asked me for the reasons behind the bad run, and I’d not come up with any. But the last time he spoke to me was in November, at the Matter of Heart premiere. He used to text me before every game, wishing me luck, up to December. He used to come to more games, but obviously he has business priorities. I got a text from him after the Yeovil game, which was fine and I understood his frustrations, but I did encourage him to come over more often if he could, and see what was happening at the club. “So for him to say he asked but didn’t get any answers, well he certainly didn’t ask me. I would have been more than happy to answer his questions, and the opportunity to have explained things to him. These players were a desperate attempt to get players in. These players wont win you promotion. They are steady players but nothing more, that is not backing that is filling gaps. The only one i’d keep from those is McGowan if we want promotion next season. I’m intrigued by this “six figure investment” assertion. Is this right? It could be anything between £100,000 and £999,999 – any which way with presumably a salary as Executive Chairman of in excess of £100,000 plus some sort of re-location expenses – he’s getting a fantastic return with not a lot of risk AND he’s getting to act as GOD with our beloved BCFC! Obviously no one goes out to ruin a club and I’m sure Rahic’s intentions were honourable. Sadly without significant investment as our previous owners continually pointed out – it is virtually impossible to get footballing success. It seems we have swapped one set of “we haven’t enough money” owners for another. Sadly it appears Rahic (and Rupp) don’t have the business vision to understand that you need around £5-10m to get us out of League 1 (Plus a good Manager, selection and recruitment). It’s not guaranteed. But if you did it – then the team if filled with 24-28 year olds might sustain the momentum and get you to that Promised Land of the Premiership. Having said that how many supporters of say Watford, Brighton, Crystal Palace enjoy seeing their teams scrape by – week after week? I would happily take good League1/Championship week in week out with a chance of success but at least enjoy the prospect of scoring a few goals. Unfortunately over the past few seasons, even the History Makers – we rarely scored three goals in a game. The solution to today’s problems will be resolved by the attitude of the Owners. They are accountable but sadly the fans, supporters and followers of BCFC just have to wait and see. Their current ostrich approach is hardly endearing and if they have too big egos to admit their shortcomings then hell, we’re in for a horrible ride to oblivion. The problem I have with the owner’s vision is their fixation on young and inexperienced players. These purchases are funded via the diversion of general revenue to finance these purchases. This means a lower payroll, drop in quality and likely relegation. These speculative purchases are not being funded by the owner’s but via season ticket sales by the fans. The owners have systematically dismantled a competitive team over the past two years. Where is the ambition and what am I supposed to believe in? You fail – as I said it isn’t guaranteed, but at least it’s a shot. Don’t quote Richmond – his strategy was based on TV money that didn’t materialise, not a surprise at the time but 15 years on – he was right? Businessmen make decisions, take risks, if I had £10 million I would make that call. My basic beef with the Owners is that they never had a real strategy except want success without investment. PP immediately saw through it – Stuart couldn’t resist the call and an amazing first season unfolded. Losing then half of your starters from a Final was always going to be a tough challenge and the new recruits looked the part, then injuries, loss of form, poor pitches start to take their toll. We never looked either outstanding or even very good in the first half of the season. Many forget our home performances had totally collapsed and only some amazing away results kept us in the top six, it was always fragile. Raeder’s mistake at Wimbledon really was a turning point but the symptoms were showing themselves well before the diagnosis was confirmed in 2018. The question I think most supporters want answering is what has stopped the players playing for our club since January? The fact they haven’t performed for either Stuart or Grayson suggests that the issues are far more deep rooted than the manager, and you would like to think that the owners will now see this and hopefully try rectify the problem. I just think though players get away with far too much these days, too pampered and overpaid; they will think nothing of downing tools to get a manager sacked, as they did with Mourinho at Chelsea. I’m not saying the players won’t have any concerns, but you are professionals, go out and do your job and perform for your football club, you are privileged to be doing something that most of us would only dream of. I am sure there have been lots of times in our working lives where we didn’t agree with the actions of the owners or our managers, but we just got on with our job, as if we had downed tools we would’ve been sacked. Imagine if this had of happened in a City dressing room 30 odd years ago, I am sure big Bobby and various others would have had the like pinned up against the dressing room wall, ordering them to start pulling their weight. You achieve nothing in football without team spirit coupled with hard work, and if this continues next season, putting it simply we will be relegated, and out of the football league the year after. I think from the back of a playoff final to lose by one late goal and all the excitement, a bit of niavety crept in and because Stuart had pulled of another miracle to this years transfer window, but that is what it was and we had got there without a Mc Cardle in the side who bled claret, we needed just that bit of added commitment and quality to keep it going to the finish line. I bet the hiarchy said we did it last year, so we can do it again without busting the budget. Cracks starting to appear due to this, us as fans waiting for the big signing not knowing what was going off, then everyone saying is that it, and a deluded comment saying this team can get automatics. Pick out of that what you want, thats how it looks to me. I would have had more respect, if they had said look we are on a long road for building and we used our budget at the start of the season and may bring in a couple of loan players at the next window, I would have expected the position where we are and nothing more, but when the owners say AUTOMATICS, you think this it this year, a great start followed by the backing of words said from them. More balanced and very good advice again here implied Jason.The inquisition meanders along.”Believe” we are asked.Difficult when you see 11 out on the park who clearly no longer “believe”,an absent main director and so many with stories of micromanagement.You give good analogy.The good owner delegates.Nobody from the ticket office clerk to the gateman likes someone constantly interfering.We hear it.Widely said.The feeling is we have 2 no more prepared to commit financially than Mark and Julian were able to.Players giving up and going through motions is an absolutely ludicrous sight.Hiding.Making runs but not really wanting the ball.Something is deeply deeply wrong.Talk of consortiums forming but reluctant sellers.Would the club be any better off? Another gamble.6 years of progress were formed not on the back of millions put forward by Mark and Julian.2 seasons of good fortune financially in the Cup run years perhaps ensured slightly more could be found for players wages.Its always going to be a struggle.Bradford City will be far better off if Edin stays out of his micromanagement.He might argue that since he has left the room things have gone from bad to worse! He would have a fair point.Money (unless in Chelski or Man United”s league) can make little difference at this level unless its millions.Luke Hendrie we are told was not rated by Rahic.Stuart wanted to sign him.We had zero full backs.Some would argue we still don”t.Today I shall be closely watching Luke Hendrie if he plays.I would back Stuarts judgement of a player before Rahic every day of the week.